Ever since he got his first series in 1976, “Howard the Duck” has been the resident loudmouth of the Marvel Universe. Much like Eric Cartman in “South Park,” it’s much easier to have a foul-mouthed duck [or a fat fourth grader] talking about the problems plaguing our society than a person anyone could really connect with physically. However, in spite of being a fowl, the social satires have always been crystal clear, making him a cult-favorite. 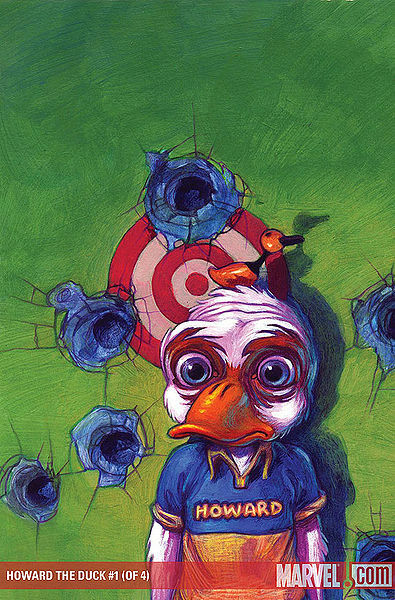 Getting back into the limelight in 2007 after a bunch of small appearances over the last 15 years, “Howard the Duck: Media Duckling,” written by Ty Templeton and drawn by Juan Bobillo is the trade paperback that allows the character to be as edgy as he deserved to be back in 1973. It’s chock-full of social commentary and is hilarious from start to finish and equally as bizarre. A weird combination, granted, but a duck that cares about the United States enough to fight for its safety from a monster controlling the media is even weirder. Nonetheless, it’s this blending of pop-culture, politics and marvel comics that make it an enjoyable page-turner. When MODOT [Mobile Organism Designed Only for Talking] takes over the media, several questions pop up throughout the reading. What is the truth? Is it what we believe or what really happens? Is the news the population views being filtered so someone can get their views across? Are the rules and laws we live by in this country holding us back from seeing things the way they ought to be? Big questions for a comic book series, well a comic book series featuring a talking duck, but by the end of it, Howard is the advocate the public needs and risks his life to defend a country he isn’t even a legal resident of. That perhaps is the biggest social commentary throughout the book. However, there’s much more in this four-issue trade to quack about. The relationship between Beverly and Howard speaks volumes about interracial relationships and how respect and love for one another means more than simply being of the same color and culture. Beverly’s rise to fame also touches upon the country’s love of good-looking women and how they’re much more disposable than they think. Then there’s the topic of gun control that is interspersed through the trade as well. All in all, this trade has enough hot topic ideas and statements to shake a tail feather at. And Howard does much more than that by the end. For this, the book is an engaging read, but the thing that will want you leaving more is the way it’s all presented. Funny and witty at its core, this trade never waxes poetic with you or force feeds you ideas. Instead, it subtly lays down its ideas and takes you on a whimsical and never too serious ride through a world that ironically is eerily similar to the one we call home.